Before I begin the reflection. I want to announce that at the end of 2017 I will have to suspend this ministry due to lack of funds. The content will remain up for as long as it can be sustained, but will not be updated. I was hoping and trusting on the Christian good-faith nature of fellow Catholics to help me run this work via donations. Unfortunately, not many have responded which is disheartening and unfortunate. Our Church tries so hard to form the consciences of baptized Catholics and it seems that we need to do more work. It seems a large portion of Catholics today just want to receive and not give back to the Church in order to help her. This is why many parishes are closing throughout the world. Going to Mass, sitting in the pews is not enough. Catholics must participate and help the Church financially and in their professional capacities in order to fulfill Christ's command to go out throughout the world and preach the Good News. I created "Sacerdotus" after a bishop I worked for called me that due to my vocation to the priesthood and my use of ornate surplices like Solanus Casey. The nickname stuck, so I used it for Christ and the Church. Via "Sacerdotus," I reached out to those out in the deep who have left the Church or were never part of her. This includes atheists due to the fact that I was one myself. After Pope Emeritus Benedict XVI called on priests, religious, seminarians and lay people to make use of social media, I created a Twitter account and later on, profiles on other networks. 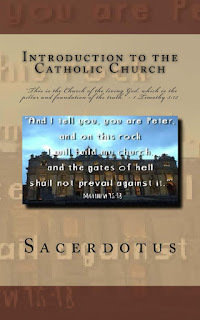 The popularity of "Sacerdotus" grew and shocked me. A religious sister on Twitter advised me to start a blog, which I did. With only $10, I bought Sacerdotus.com and the site began to grow, now worth over $2,000. I started with 12 views and now am about to reach 1 million, thanks be to God! As mentioned before, I hoped for fellow Catholics to help me due to the fact that I am in formation and cannot afford to go into debt. The Church cannot allow seminarians or religious to have debt or this will burden their respective communities/dioceses. This is why I asked for help. Some responded, but not many and not frequently. In response, I tried offering an advertising service and that helped for a bit. To supplement this, I began to write books hoping Catholics and other will buy them to help me offset expenses. Unfortunately, the response to the books has not been what I expected. It seems as if Catholics just do not care about the faith or spreading it. I am hoping this is not the case. Moreover, it is mind-boggling to me that some Catholics contribute to other alleged "Catholic" sites which are based on gossip, conspiracy theories, distortion and slander of the Holy Father, yet, seem to not want to help Catholic sites that truly are faithful to the magisterium, do not slander the pope and focus on evangelization. My content is geared around Catholicism, Science, Philosophy and other worldly issues in order to "go out into the deep" and fish for those far away from the Church. I am hoping that "Sacerdotus" was helpful to you reading this. So far, there have been over 20 converts due to the content on "Sacerdotus," whether here, in my books or podcasts/broadcast. As I write this, I am in NYC and will be participating in liturgies receiving atheist friends into the Church! I call this a true success despite not having enough funding to continue expanding this work. I hope that in the future, readers will be more generous and understand my situation and help me continue and expand this work. Donations will help me with expenses and are not for restitution or "payment" of services offered. This is not a business, nor do I want it to be. I genuinely just need some extra help from my brothers and sisters in the Catholic faith. Any amount is truly welcomed. God will reward you. Please consider donating and becoming a benefactor by donating monthly, bi-monthly etc. This will allow me to continue this work and expand it so I can reach more people via many channels. You are a part of this work as well. 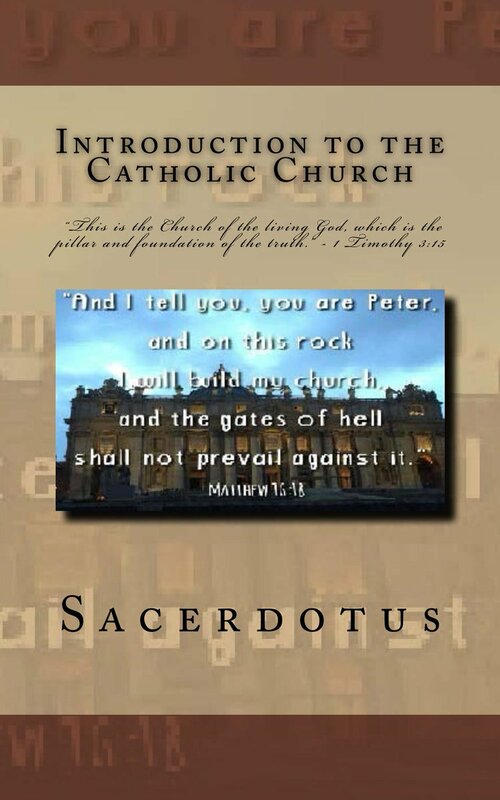 One of the differences between "Sacerdotus" and Catholic Answers or EWTN is that you can directly help in this work. You can offer an article to be posted on Catholic Faith Sharing or can join me live on my broadcasts and podcasts. Catholics Answers, EWTN or any other Catholic site will not allow this. I am not attack them, please do not misinterpret me. They have been instrumental in my own conversion. What I am pointing out is that our work here is more open and truly a grassroots effort that excludes no one unless there is conflict between the person's views and that of the Church. So again, please do not let "Sacerdotus" disappear, please donate and become and regular donor. You can also help by purchasing my books. My latest book, "Introduction to the Catholic Church" will truly benefit Catholics and others who are curious of the Catholic faith. You can purchase it in paperback for $12 or Kindle Ebook for $9.99. Palm Sunday or Passion Sunday is the last Sunday of Lent and the beginning of Holy Week. Today we remember the Passion of Christ. 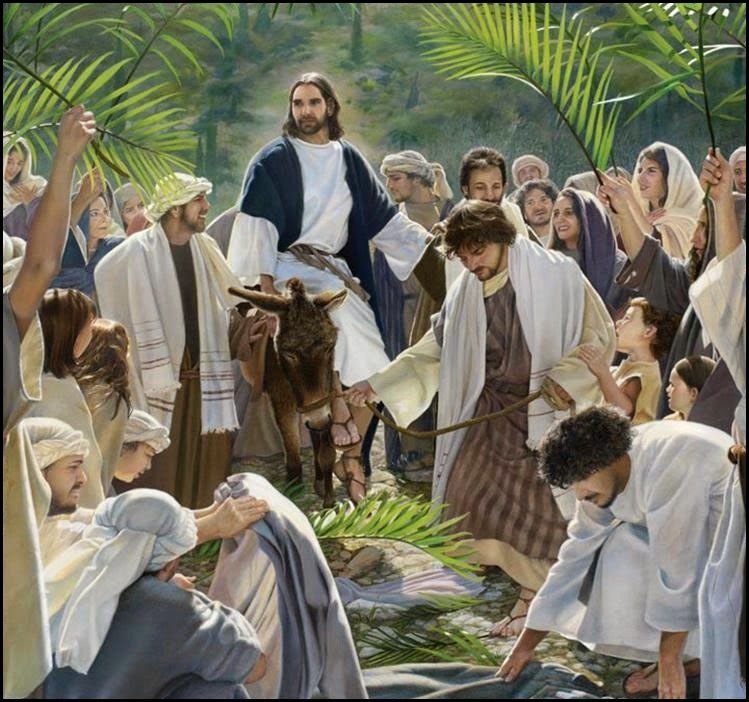 Jesus entered Jerusalem while the people shouted Hosanna and threw Palm branches in his path. The King of the Jews, the King of Kings, the King of the Universe and anything else beyond is about to suffer for us all. Hosanna is an exclamation of supplication in a moment of emotion. The Palms are a sign of victory and joy. The people celebrated the Triumphant entry of the King of Kings into Jerusalem. Ironically just a few days later some of these same people will call upon Pilate to crucify Him. Zechariah 9:9 prophesied this day. The account of the story is read prior to the procession with the palms and comes from Matthew 21: 1-10. In the Catholic Church, red vestments are used to symbolize the blood Jesus would shed as a result of His entry into Jerusalem. One procession with palms is done. Palms are used for the procession; however, other kinds of greenery can be used in its place, according to the Directory on Popular Piety and Liturgy. These sacramentals are meant to remind us of Christ and His passion. They are not magical items or meant to bring about superstitious beliefs. The Directory states: "Palms or olive branches should not be kept as amulets, or for therapeutic or magical reasons to dispel evil spirits or to prevent the damage these cause in the fields or in the homes, all of which can assume a certain superstitious guise. Palms and olive branches are kept in the home as a witness to faith in Jesus Christ, the messianic king, and in his Paschal Victory." The first reading during Mass is from Isaiah which is connected to Jesus. It reflects on how Jesus is a gifted speaker who spreads the Good News yet offends many or stirs up a commotion among the people. Because of this, He is beaten, his beard is plucked and He is mocked. This reading is a foreshadowing of the Passion of Christ. Despite being abused by the people, Jesus returned no insult or attack (1 Peter 2:23). He braved it all for the sake of all (Isaiah 53:4, Matthew 8:17). Jesus was truly obedient, even unto death. Today we live in a world where Christ’s message is not popular. Priests, religious, laity, and even our separated Christian brethren face all kinds of hardships just for speaking the name of Christ and what He stands for. The Word of God is being criminalized in many parts of the world. This opposition shows us how bad the world dislikes Christ and religion. Elsewhere in the world, Christians are being killed just for believing in Christ. While things may seem bad and scary, we must not fear. God is with us. We must be strong and not give in to the pressures of the world and preach Christ in season and out of season (2 timothy 4:2). Like Christ, we must bear it all for the sake of salvation. God is with us, no one can stand against us (Romans 8:31). It may seem like God has abandoned us and this is why the responsorial Psalm begins with this phrase. This Psalm is another foreshadowing of Christ’s passion. Christ Himself felt abandoned by the Father. However, this is not so. God was there present comforting Him and us as well who struggle today. Finally, the Gospel tells the account of Jesus’ arrest and His last supper where He instituted the Holy Eucharist. Christ defined for all the true meaning of the Passover meal by breaking bread and sharing wine which are His body, blood, soul and divinity. Like with the Hebrews during Passover, this meal protects us from the plagues in the world and prepares us for the Exodus to our spiritual promised land (Exodus 12:1-14). The journey will not be easy. We will be attacked by the world and will walk through the desert of life (Matthew 10:18, Exodus 13:18). 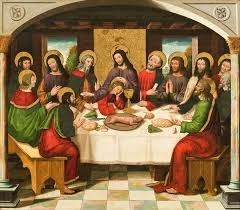 Furthermore, we read how Judas is there present during the meal. He sells out Jesus for 30 pieces of silver. Judas is the first to leave the first Mass at the Last Supper. How many times do we see people leave Mass early? Perhaps we may have done it ourselves? We are imitating Judas the betrayer when we leave Mass early. In doing so, we make whatever we are leaving Mass for more important than Christ. Granted, there may be emergencies we may have to attend to, but this is where faith comes in. God will take care of any emergencies for us. Moreover, we continue reading how Christ tells the disciples how they will flee when He is arrested. Each boldly claims that he will not leave Christ. How many times have we been vain in thinking that we have total control of faith? How many times have we thought that we control grace in us? It is God who sustains our faith and nourishes us with His grace (James 4:6). We only cooperate by the suspension of our free will in order to submit to God’s will. Christ then goes to the Garden of Gethsemane to pray. He cries tears of blood showing the pain and anguish He was going through. We again see Christ’s humanity. He is one of us! He is the perfect Adam we must imitate (Romans 5:12-18, 1 Corinthians 15:45). However, like the disciples, we often fall asleep when we are in His presence. Instead of praying, we slack off and get distracted to the point of dosing off. We must avoid this by asking God to teach us how to pray and give us the strength and demeanor to be in His presence to pray even when our human frailness gets in the way. It is in prayer that we unite with God. Lastly, we continue reading how Christ is taken to trial. The Son of God, God Himself is treated like a criminal. He is sentenced to be killed by way of Crucifixion. His crime is love (John 3:16). Christ came to save all, first to His own people the Jews. Ironically, it is sometimes our own that betray us. We must avoid being like the Jews of Christ’s time who were with Him, saw His works and still wanted no part of Christ. Like the Jews in the desert, they saw His works and still did not want to believe (Psalm 95:8). Christ is then made to go through a horrible death. First He is made to carry a heavy cross. Throughout the way, He is mocked, spat on, hit and falls down three times for the sins of the past, present and future (Hebrews 13:8). He dies on the cross and is buried. God is dead! Today, this phrase still echoes among western societies throughout the world who have lost their Christian roots and especially in universities teaching our youth. 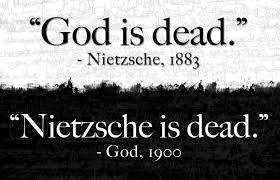 Some believe philosopher Nietzsche to have coined the phrase “God is dead,” but this has existed way before his own birth. Christ is nailed to the cross and dies. The people of His time said, “God is dead.” The Son of God who performed miracles and preached the good news dies. We know that in reality He is still alive (Revelation 1:18). Man can kill God because God allows it out of love. Today’s age of secularism, atheism, and relativism shout, “God is dead, we have killed Him!” However, God is alive and well. He rose from the dead showing He is the God of the living and dead (Romans 14:9). He is the one who IS; who is dependent on no one for existence (Exodus 3:14). We must not be like the Jews of the old covenant who saw and still did not believe, nor do we want to be like the Jews in Jesus’ times who like their ancestors saw Christ’s works yet did not believe as well. They even proclaimed Him as their king by throwing palms onto His path only to reject Him and call for His execution days later. We should not be like them. We must never lose faith nor let the world silence it as it grows more hostile to religion. Today we lift up our palms, not like those hypocrites in the Gospel reading before Mass, but like those in Revelation 7:9 who see the Lamb of God, hold their palms out to Him in joy and wear clean white robes showing they are made spotless by the blood of Christ shed for all during His Passion. Palm Sunday is upon us. Raise your palms high and let the world know that we are Christian and will not be silenced. We are in Christ and no one can stop us. We are the Easter people who defy all odds in the name of Christ the Lord (Philippians 4:13). May Christ teach us how to live and suffer in faith. He suffered for us all showing that each human life has worth and is sacred. When I say each human life, I mean every one including non-Catholics, those who hate us, those who do not trust us, those who call themselves pro-abortion, gay, lesbian, transgender, atheist, agnostic or indifferent. Jesus is the King of all and suffered for all because all people have value and God loves all so much that He wanted humanity redeemed. Let us shout Hosanna to the King with sincerity and remain with Him through good times and bad times until the end of time comes. May Jesus Christ be praised! Let us spread before his feet, not garments or soulless olive branches, which delight the eye for a few hours and then wither, but ourselves, clothed in his grace, or rather, clothed completely in him. We who have been baptized into Christ must ourselves be the garments that we spread before him. Now that the crimson stains of our sins have been washed away in the saving waters of baptism and we have become white as pure wool, let us present the conqueror of death, not with mere branches of palms but with the real rewards of his victory. Let our souls take the place of the welcoming branches as we join today in the children's holy song: "Blessed is he who comes in the name of the Lord. Blessed is the king of Israel." Source: Office of Readings, Oratio 9 in ramos palmarum: PG 97, 990-994. If Jesus reign in my soul, in your soul, meant that he should find it a perfect dwelling place, then indeed would we have reason to despair. But Jesus makes do with a poor animal for a throne…There are hundreds of animals more beautiful, more deft and strong. But it was a donkey Christ chose when he presented himself to the people as king in response to their acclamation. For Jesus has no time for calculations, for astuteness, for the cruelty of cold hearts, for attractive but empty beauty. What he likes is the cheerfulness of a young heart, a simple step, a natural voice, clean eyes, attention to his affectionate word of advice. That is how he reigns in the soul. 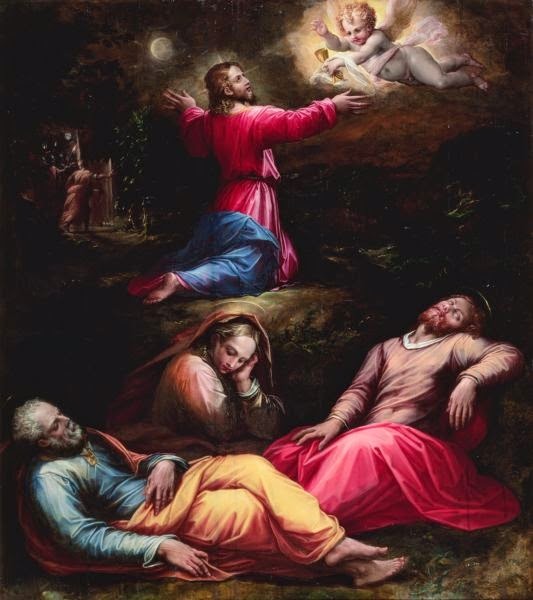 Source: Christ Is Passing By, 181. When Jesus enters Jerusalem, the whole city is in agitation. People are asking themselves, "'Who is this?' And the crowds [say], 'This is the prophet Jesus from Nazareth of Galilee'" (Mt 21:10-11). This was not the first time that the people recognized Christ as the king they expected. It had already happened after the miraculous multiplication of the loaves, when the crowd wanted to carry him in triumph. Jesus knew however that his kingdom was not of this world; for this reason he had fled from their enthusiasm. He now sets out for Jerusalem to face the trial that awaits him. He is aware that he is going there for the last time, for a "holy" week, at the end of which the passion, cross and death await him. He faces all this with complete willingness, knowing that in this way the Father's eternal plan will be fulfilled in him. Since that day, the Church throughout the world has repeated the words of the crowd in Jerusalem: "Blessed is he who comes in the name of the Lord". She repeats it every day while celebrating the Eucharist, shortly before the consecration. She repeats it with particular emphasis today, Palm Sunday. Source: Homily on March 23, 1997.